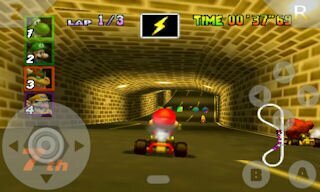 The godfather of video game console emulation on Android, yongzh, is back with a Nintendo 64 emulator called N64oid. He already had many different Sega and Nintendo emulators in the Market, so yongzh is a coder who’s an expert on bringing retro video games to modern Android smartphones. N64oid was released yesterday, and yongzh admits that his Nintendo 64 emulator currently is far from perfect, but he also promises frequent updates and improvements. You need a high-end Android device to use N64oid – a 1GHz processor and 524+MB of RAM – and the emulator runs some games surprisingly well on my HTC Desire. Conversely, many Nintendo 64 titles that I tried couldn’t be played with N64oid at all. When using N64oid, you will doubtlessly encounter hiccups, stuttering sound effects and frame rates so low that the games in question are unplayable, but some titles – like Super Mario 64, are very smooth and almost feel like native Android games. Overall, I’m impressed by N64oid and I think it shows a lot of promise. My HTC Desire is a year old now, and I suspect that using the emulator on a phone rocking the latest dual-core hardware will improve its performance. If you’re into old-school gaming I definitely recommend that you head to the Market and buy N64oid right now: the entertainment it brings is definitely worth $5.99, and the emulator is bound to get better. Run most games smoothly at a reasonable speed (if not full speed) with sound. This requires you have a high-end device (Nexus-S, Nexus-One, Droid, Samsung Galaxy, etc). Save/load game states at ANY points, as well as the in-game save support (SRAM, EEPROM, etc). A configurable, translucent on-screen keypad that is very easy to use. Key mappings to map game keys to hardware buttons. Option to use the G-sensor as the analog stick. A variety of settings that you can tune on your needs. is there a way to let them work , or is there a new version of n64oid ? do you know if there is n64 emulator for nokia n8 ? and if no , do you think it could be possible later ? can I use this emulator on my nokia n8 ? Unfortunately not. As the title of the post says, this is an emulator for Android, and the Nokia N8 runs a mobile OS called Symbian.